Clampitt Paper is a family owned and operated company; it was started in 1941 by Max Clampitt and is now run by his youngest son Don Clampitt. In 2016, Clampitt Paper celebrated 75 years of business. Clampitt is a wholesale paper merchant that sells everything your business needs in relation to Paper. Copy Paper, Envelopes, Digital and Offset sheets, Web to print rolls, Pressure Sensitive, Custom Diecuts and so much more! Clampitt sells direct to large and small scale printers as well as creative designers and local artists. Stop by our offices or give us a call to see what Clampitt can do for your business! Clampitt Paper keeps growing! In 2012, Clampitt Paper added locations in Albuquerque, New Mexico; Overland Park, Kansas and Tulsa, Oklahoma. 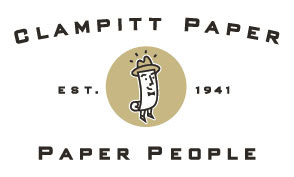 Most recently, Clampitt Paper of Springfield officially opened for business on June 1st of 2014 in Missouri. Check out our locations page to see all of our locations throughout the Southwest. If you have any questions about our expansion please don’t hesitate to contact us at info@clampitt.com.